I had to take a few days to just let this amazing book sink in before I reviewed it. I recently read The Last Namsara and quite enjoyed it! 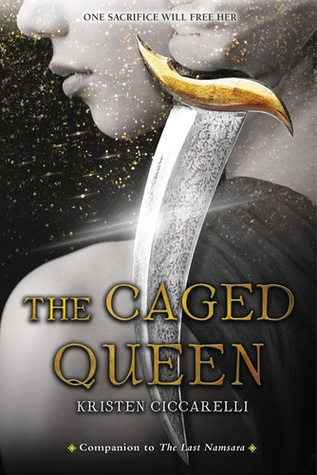 I was thrilled to see there was going to be a sequel, The Caged Queen which I found out while reading, it's a companion to The Last Namsara, which means you can read the books in whatever order you'd like. This story is about about Roa, Asha's brother's wife. I'd realized as soon as I started the book that I didn't remember a lot about the last book, which didn't matter. The fact that Roa had to plunge a knife into her 'sister' almost made me cry, and I was overjoyed Roa didn't end up helping Rebekah. Essie was a character who I didn't even know, and somehow I managed to love and adore her. She was everything Roa used to be before she lost Essie. The idea of Roa still being able to talk to her sister and have her advice was an amazing idea and I liked it every time she appeared. When Asha finally appeared in the book, it made me extremely happy for some reason, even though she was barely in the book. My heart broke when Roa got Essie's freaking wing in a box, it hurt my heart. Such a cool idea that Roa could feel when her sister was hurting or feel her drifting away. I did feel at times that Roa and Dax's relationship was so broken that it was beyond repair. I just wished there had been more happiness between the two at the end of the book. After reading this book, I will definitively be picking up the other companion books when they come out!